These small coolers are especially interesting for components which are too small or uneven to be equipped with a large cooler. 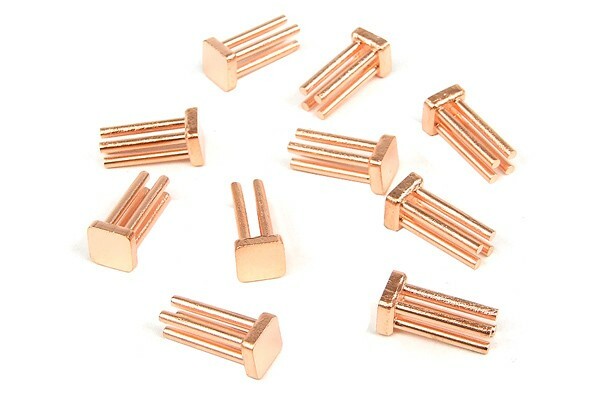 The copper contact plate with 12mm long cooling pins is equipped with self-adhesive strips which allows flexible application wherever the coolers are needed. These coolers are often used for cooling of VRM modules e.g. on graphics cards. Wie klebt man diese Passivkühler auf die Spannungswandler ? Die Kupferbodenplatte mit 12mm langen Stäben ist mit Wärmeleitklebepads versehen, die überall dort aufgeklebt werden können, wo sie benötigt werden.